Discover the perfect romantic island getaway at Sandals Grande Antigua. 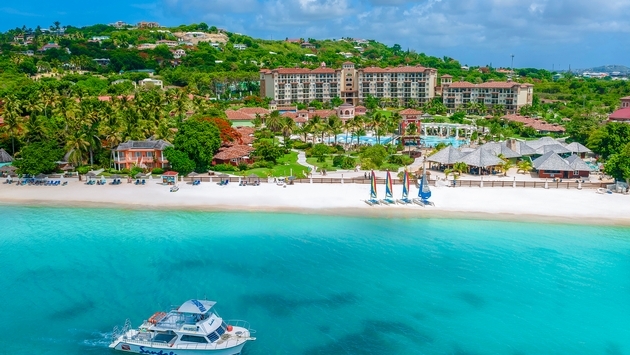 The all-inclusive resort is nestled along the vibrant coastline of Dickenson Bay—one of the Eastern Caribbean’s most beautiful beaches featuring alabaster sand, remarkable ocean views, and breathtaking coral reefs. Exalted by nature’s unparalleled beauty, the sophisticated resort is one of 16 properties owned throughout the Caribbean by the renowned Sandals Resorts brand. As with all properties in the company’s portfolio, Sandals Grande Antigua pampers guest with unparalleled amenities and an unmatched number of quality inclusions. Designed exclusively for two people in love, the resort’s elegant accommodations grant couples cozy sanctuaries where every detail has been carefully planned to provide guests with the ultimate romantic retreat. Rooms boast Italian floor tiles, solid mahogany furniture, lavish fabrics from Turkey, Italy and India and opulent marble baths. Moreover, top-tier suites also feature private plunge pools, Tranquility Soaking Tubs for two and a personal butler trained to the highest standards of the Guild of Professional English Butlers to cater to your every whim. In true Sandals fashion, incredible accommodation luxuries and superb hospitality are just the beginning. The resort gives you an array of amenities with everything imaginable to ignite passion in paradise including beachside fire pits, entertainment under the stars and a different epicurean adventure every night of your stay. With Sandals 5-Star Global Gourmet dining program you enjoy unlimited delectable specialties prepared by world-class chefs at the resort’s 11 restaurants—each offering its own unique charm. In addition to scrumptious dishes, the resort’s seven lively bars serve endless pours of premium spirits and Robert Mondavi Twin Oaks wines. Other resort amenities include an impressive 15,000 square foot Mediterranean pool with a sunset tower and two swim-up bars, six freshwater pools, six whirlpools and cabanas with valet service, as well as, unlimited land and water sports including tennis, yoga, Hobie Cat Sailing, kayaking, snorkeling, and unlimited scuba diving for certified divers. For those seeking relaxation bliss, Sandals Grande Antigua offers optional spa treatments at the 6,500-square foot award-winning Red Lane Spa. Enjoy a variety of indulging massages, organic scrubs, and innovative wraps in ten aromatic treatment rooms. Romance abounds at this award-winning tropical paradise. Book your Luxury Included Vacation today and revel in the best of the Caribbean. Visit sandals.com or call 1-800-SANDALS.